An intimate evening of dance with a renowned company. The Taylor 2 Dance Company returns to the Adelphi University Performing Arts Center on Saturday, April 8. Garden City, NY - March 24, 2017 - The Taylor 2 Dance Company returns to the Adelphi University Performing Arts Center (AUPAC) to showcase the athleticism, humor and range of emotions found in Paul Taylor’s work. The Taylor 2 Dance Company will perform on Saturday, April 8 at 8:00 p.m. in the Dance Theatre, AUPAC, 1 South Ave, Garden City, New York. This program will feature four acclaimed Paul Taylor dances: Images, Tracer, Profiles and his signature work, the exuberant Esplanade. Paul Taylor established the Paul Taylor 2 Dance Company in 1993 to ensure that his works could be seen by audiences all over the world, unhindered by economic or technical limitations. Working with longtime colleague Linda Hodes, he modeled Taylor 2 after the original six-member company he established in 1954. 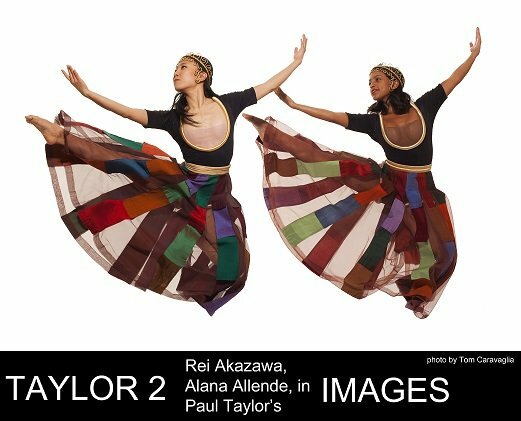 Taylor 2 is able to perform in smaller venues with more modest budgets than the larger Paul Taylor Dance Company without sacrificing any of the artistry that characterizes a Taylor performance. One of the most accomplished artists this nation has ever produced, Paul Taylor continues to shape America’s indigenous art of modern dance as he has since becoming a professional dancer and pioneering choreographer in 1954. Having performed with Martha Graham’s company for several years, Mr. Taylor uniquely bridges the legendary founders of modern dance – Isadora Duncan, Ruth St. Denis, Ted Shawn, Doris Humphrey and Ms. Graham – and the dance makers of the 21st Century. Through his new initiative at Lincoln Center – Paul Taylor American Modern Dance – he is presenting great modern works of the past and outstanding works by today’s leading choreographers alongside his own vast and growing repertoire. And he is commissioning the next generation of dance makers to work with his renowned Company, thereby helping to ensure the future of the art form. As an integral part of his vision, these dances will be accompanied by live music, wherever possible, when so intended by the choreographer. Paul Taylor taught dance at Adelphi University in 1962. He was awarded an honorary doctorate by the university in 2008. AUPAC is one of Long Island’s premier cultural arts venues for entertainment of all kinds. Tickets are currently on sale and are priced at $35, with discounts available to seniors, students and alumni. Information is available at the Lucia and Steven N. Fischer Box Office at 516.877.4000 or boxoffice@adelphi.edu. Regular box office hours are Tuesday through Friday from 1:00-6:00 p.m. The box office is also open two hours before most scheduled performances. Adelphi University is a highly awarded, nationally ranked, powerfully connected doctoral research university offering exceptional liberal arts and sciences programs and professional training with particular strength in its Core Four—Arts and Humanities, STEM and Social Sciences, Professions, and Health and Wellness. Adelphi is dedicated to transforming students’ lives through small classes, hands-on learning and innovative ways to support student success. Founded in Brooklyn in 1896, Adelphi is Long Island’s oldest private coeducational university. Today Adelphi serves nearly 7,500 national and international students at its beautiful main campus in Garden City, New York—just 23 miles from New York City’s cultural and internship opportunities—and at dynamic learning hubs in Manhattan, the Hudson Valley and Suffolk County, and online. LongIsland.com's 2015 April Family Fun Guide: Celebrate Spring, Enjoy the Outdoors, Fun Festive Fairs & More! Subject: LongIsland.com - Your Name sent you Article details of "Taylor 2 Dance Company to Perform at Garden City's Adelphi University on April 8"